The Black Bear is one of the most ferocious and feared created in North America. These large bears were creatures of myths and legends among the First Nations of Canada. The Royal Canadian Mint has captured the spirit of this great beast on a new coin. Now, you can buy the 2017 1 oz Proof Silver Canadian Majestic Animal Series Bold Black Bears Coins on Silver.com. Mintage limited to 6,500 coins only! Fifth coin in the Majestic Animal Series from RCM. Reverse features the Bold Black Bear image in full color. The Majestic Animal Series from the Royal Canadian Mint aims to show some of Canada’s most intriguing animals on a beautiful silver coin. As the fifth coin in the series, the Bold Black Bear follows the Regal Red-Tailed Hawk, Commanding Canadian Lynx, Baronial Bald Eagle and Benevolent Bison coins. 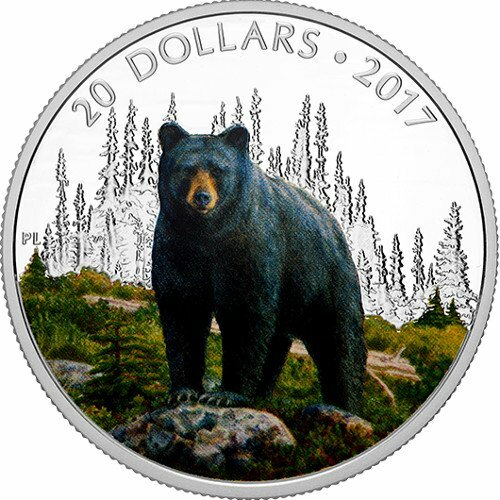 The reverse of the 2017 1 oz Proof Silver Canadian Majestic Animal Series Bold Black Bears Coins showcase the large bear standing on rocks in front of a heavily forested area. The bear and all the foreground is fully colorized. Above the bear, the year and the face value are displayed. 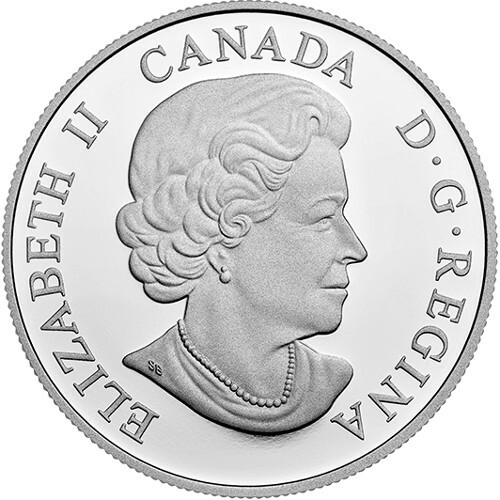 The obverse of each coin features the image of Queen Elizabeth II. The rendition of the Queen’s likeness was created by Susanna Blunt in 2003. While other images of the Queen have been used in the past, this one has been found on all coins created after 2003. The Queen’s name, the issuing country and “D.G. Regina” are all present on the obverse, as well. As the sovereign mint for Canada, the Royal Canadian Mint produces all the coins for the country. The RCM was opened in 1908 in Ottawa to give Canada the ability to make its own currency without needing to rely on the Royal Mint. Now, the mint has a second facility in Winnipeg, which has allowed it to ramp up production. Please contact Silver.com with any questions. You can reach us at 888-989-7223, chat with us live online, or email us with your inquiries.